We begin with a drawing. The child draws a subject (tiger), then completes the picture using their own creative ideas and techniques (tall grass blowing in the wind)—they draw their world. See SAMPLE LESSONS. SEE THEIR ART - See the children's artwork and writing. Drawing makes writing practice fun! Simply introduce letter formation and basic sentence structure or focus on carefully practicing and developing handwriting skills. Or, use the drawing as a prompt to strengthen other language art skills: composition, creative writing, grammar and speech. HANDWRITING: Fun ways to practice! ...and learn about the world. Each book in the series, Draw Write Now, Books 1-8, is a unit study which introduce history, science, social studies and geography. The themes are broad and appear simple, but are actually quite full. The lessons often spark an interest in further study. 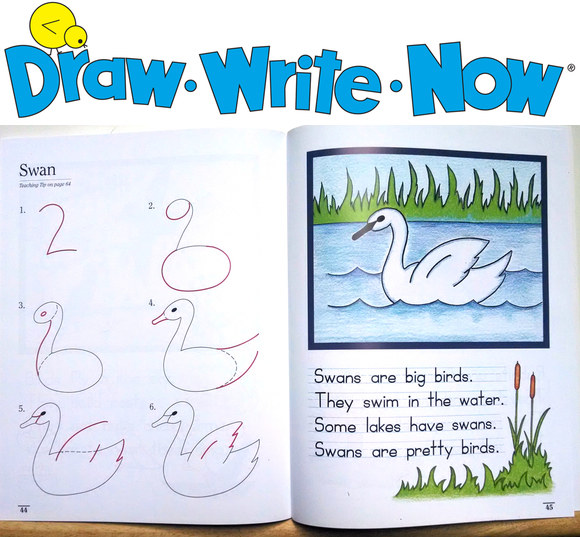 ABOUT US—we are the authors of Draw-Write-Now. Drawing Makes Writing Practice Fun!